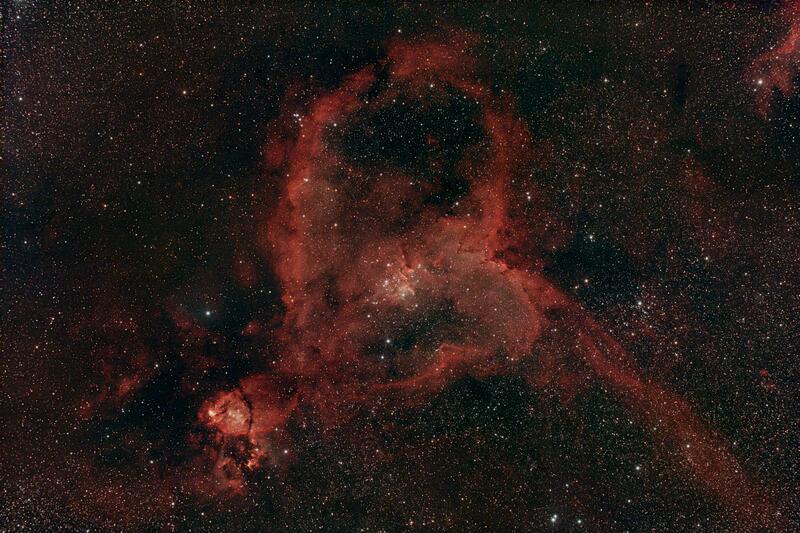 Find here some pictures of nebulas taken in natural colors. 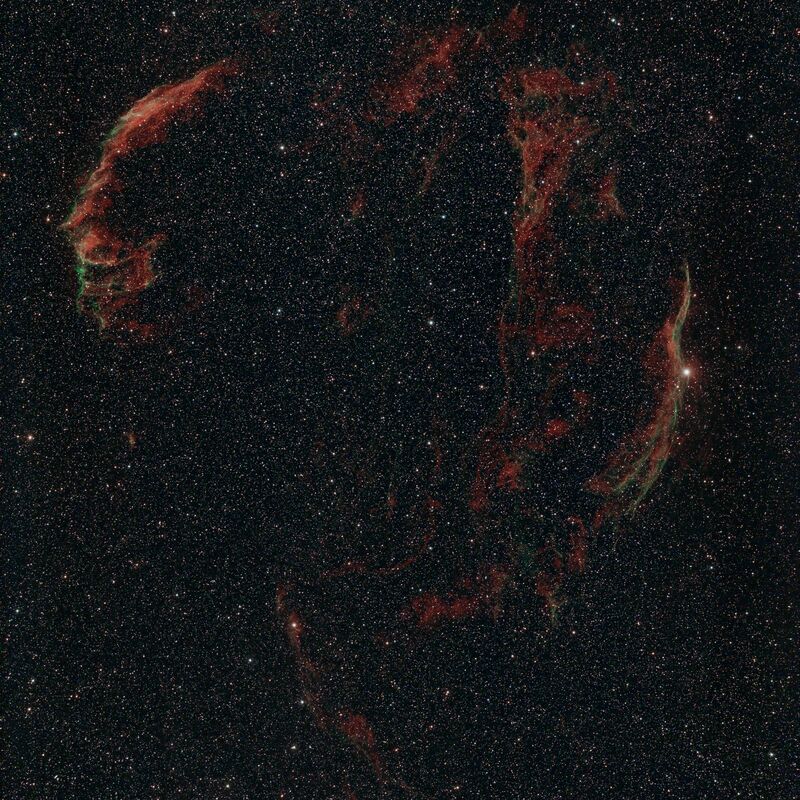 Sometimes a small portion of „narrowband light“ has been used in order to improve the scene, but alway a realistic color calibration has been sought. 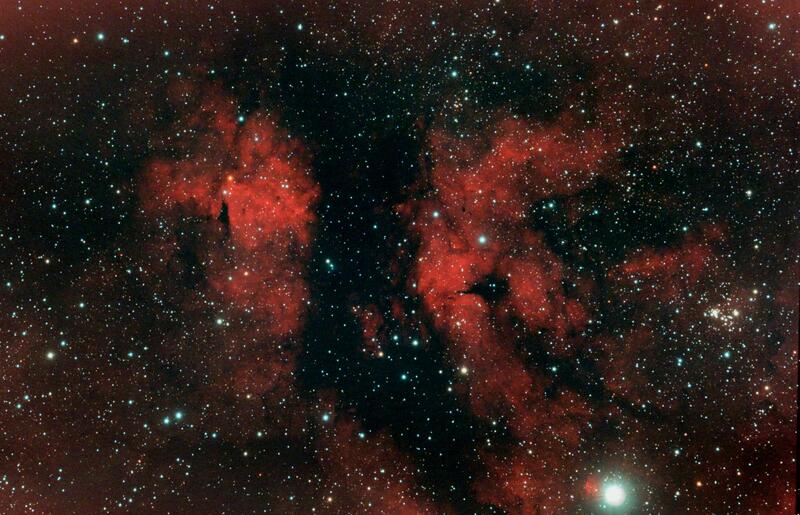 Remark: Erroneously I took the RGB frames with my 383 camera at 415mm. The combination in PI did not make any real trouble. The underlying L frames have been taken with the 490 and a CLS filter. 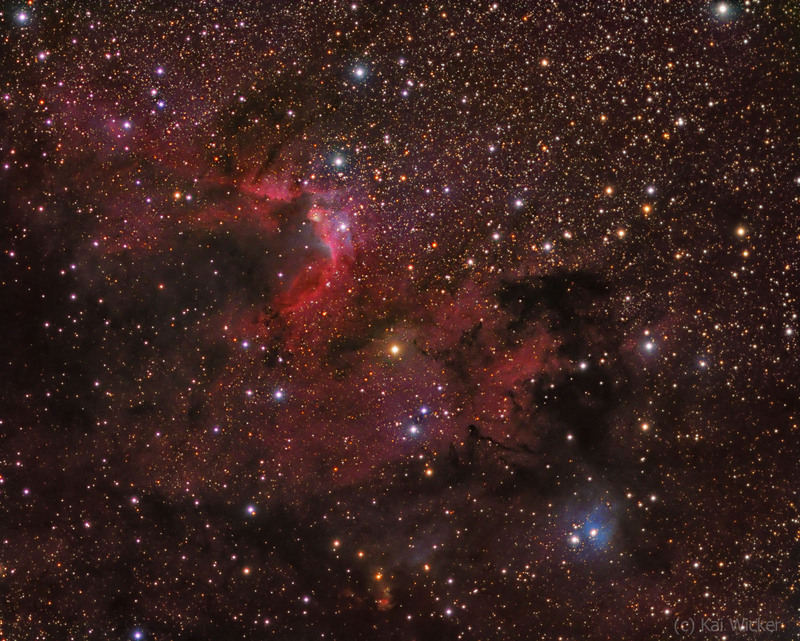 Remark: Cave Nebula or Sh2-155, the blue reflection nebula VdB 155 and the blob near the bottom a Herbig Haro Object (HH 168). Remark: Almost the complete DSLR chip used. A significant crop at the left and right side, only. 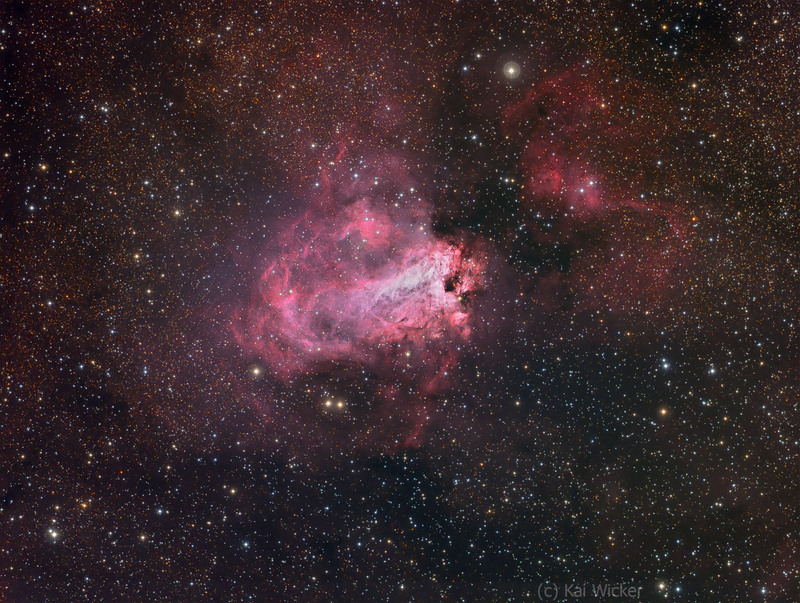 Remark: The Omega Nebula shot during two nights. 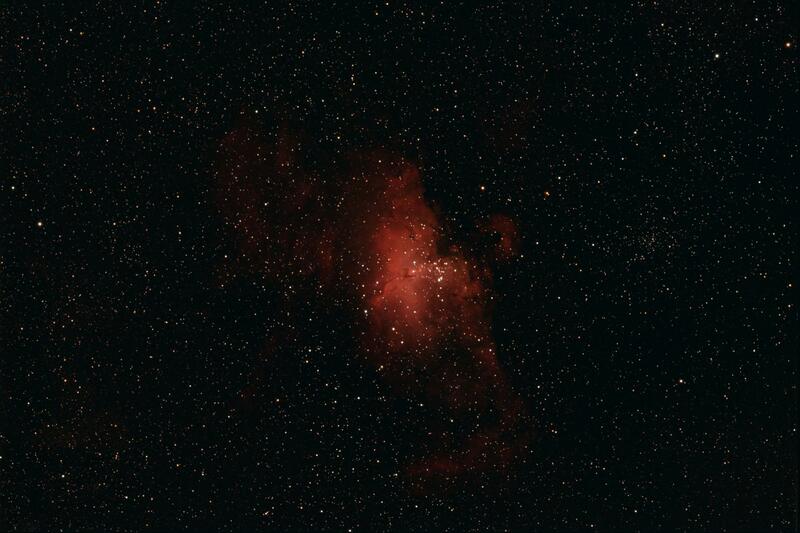 I was quite surprised how bright the center of the nebuala was. I performed a bit HDRMultiscale processing in order to cope with that issue. Find here some more information in german. Remark: A full view of the famous SNR. Remark: North is up. The pic shows an area of 3.3 deg x 3.3 deg. 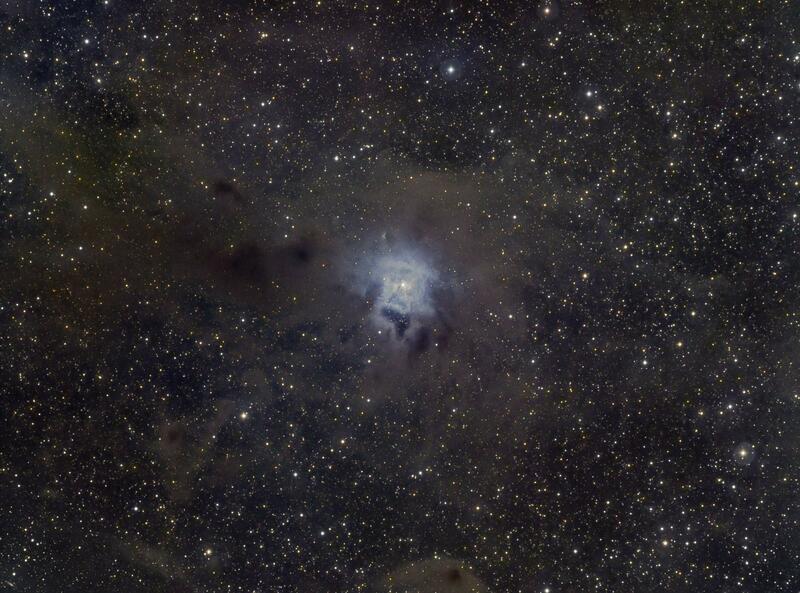 Finally I was able to catch almost the whole nebula in one photo. Presumably my last shot awaiting the white nights of northern Germany. 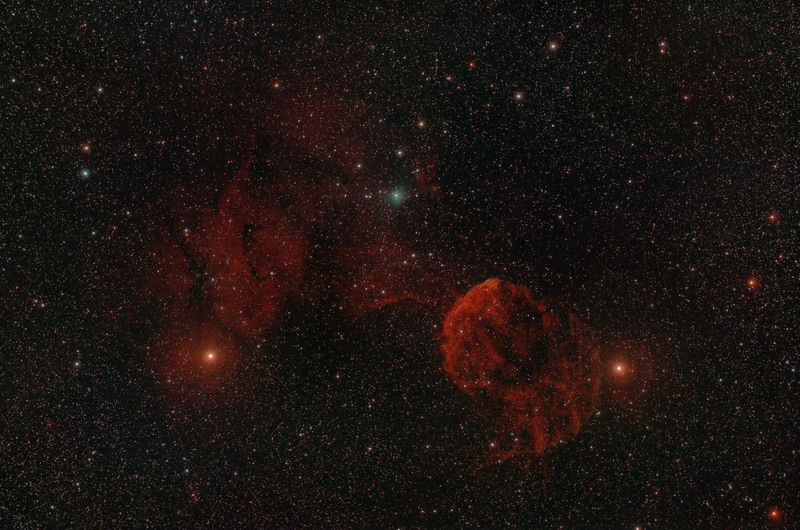 Remark: IC 443 is a SNR in Gemini (right in this image). 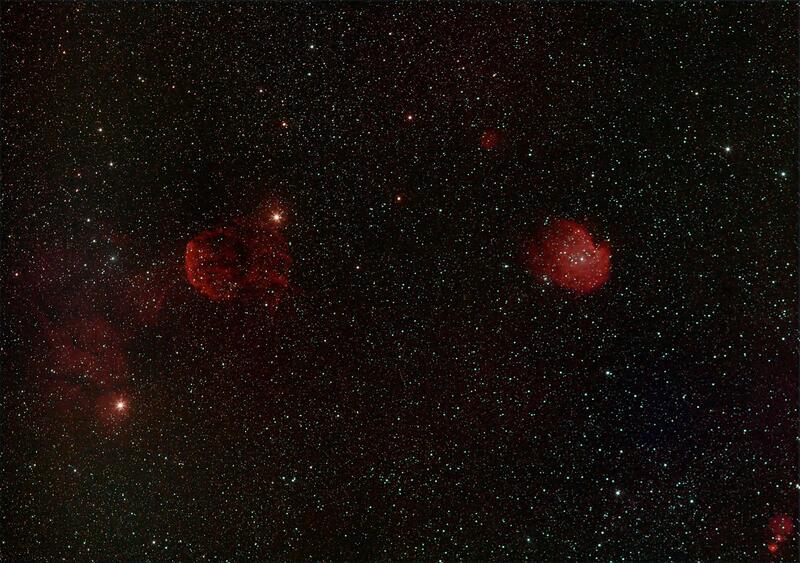 The two bright stars are Mu Geminorum (left) and Eta Geminorum (right). Distance of this region approx. 5000 ly. Remark: North is up (PW=178°). Objektbeschreibung: A very famous region in Orion. 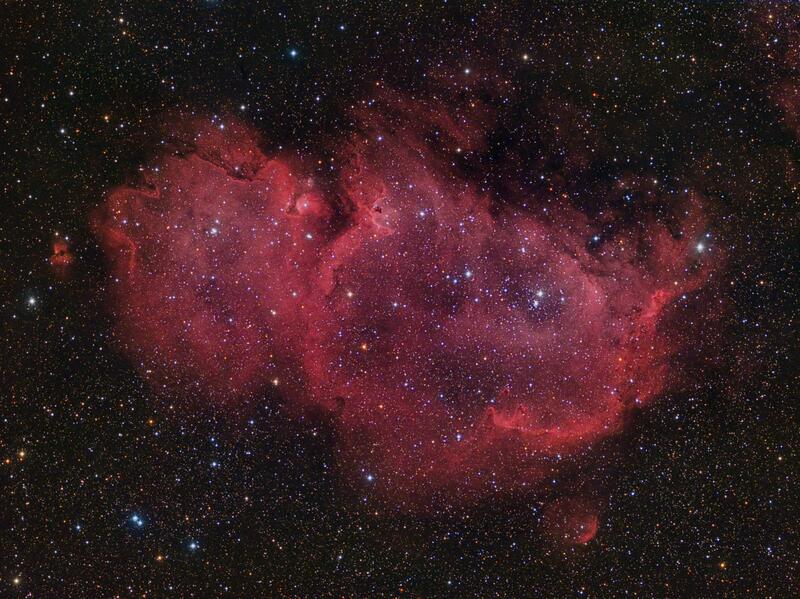 and IC 410 in the winter constellation Auriga. 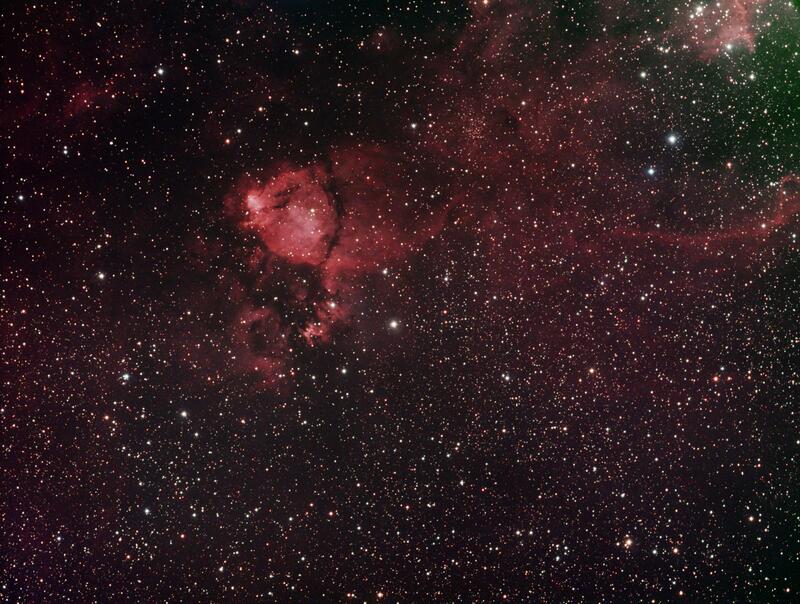 Description: Bright H II nebula in Cassiopeia. 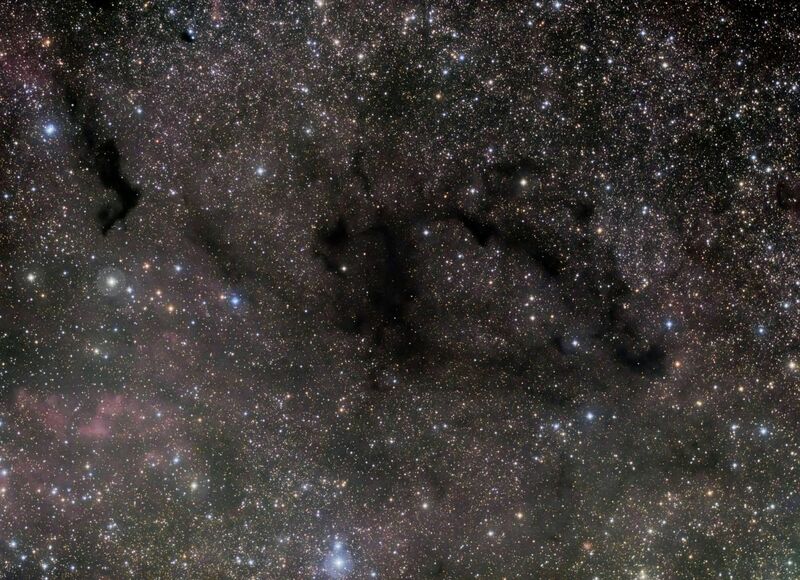 Description: Bright nebula in the Perseus Arm of our Galaxy. Description: NGC 7023 is a bright reflection nebula in Cepeheus. 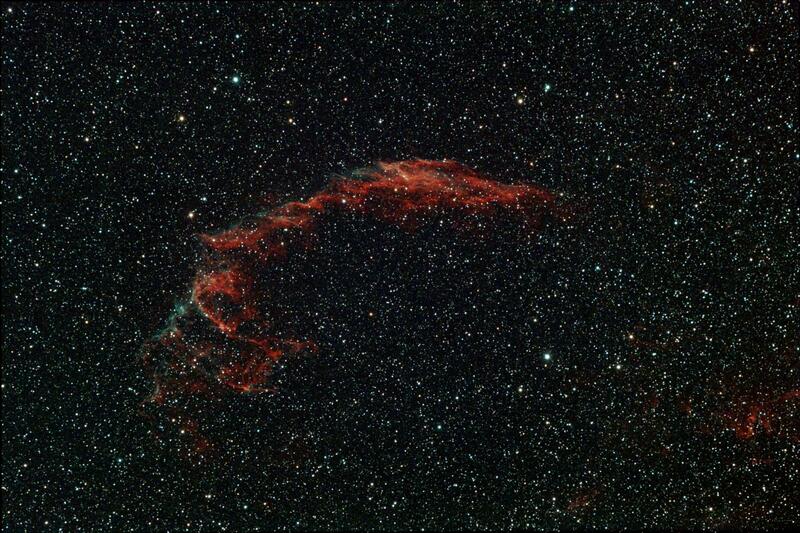 Description: IC 443 is a Galactic supernova remnant in the constellation Gemini. 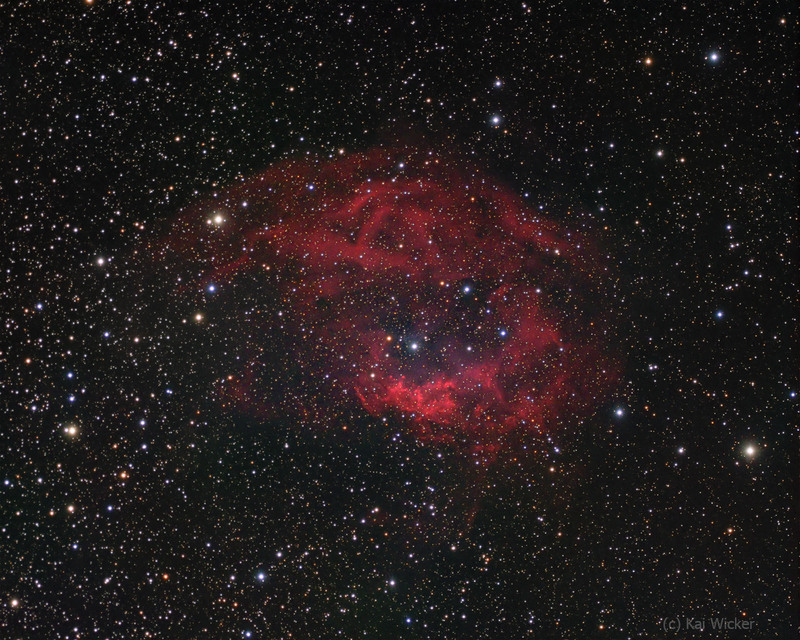 Description: IC 5146 is a reflection and emission nebula in Cygnus. Camera: Canon EOS 350Da, CLS, ISO800, 13 darks, 14 bias, 15 flats. 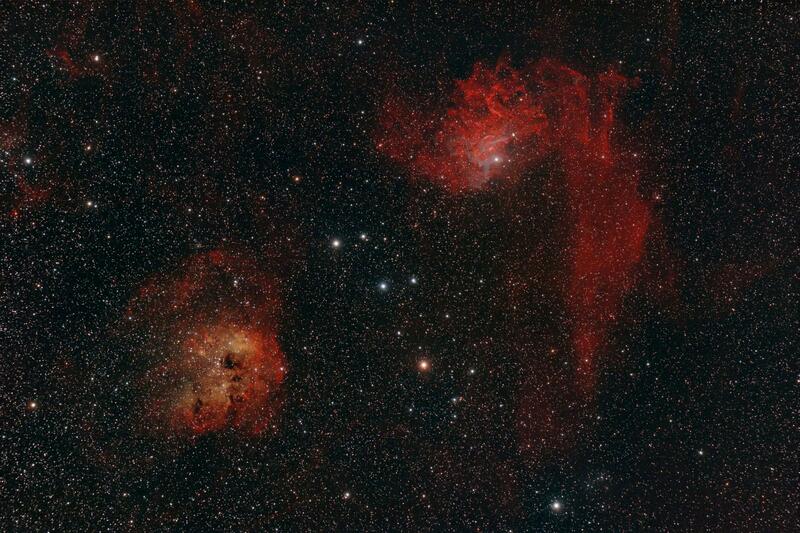 Processing: DSLR-Focus, APT-Tools, DSS, Fitswork, Photoplus. 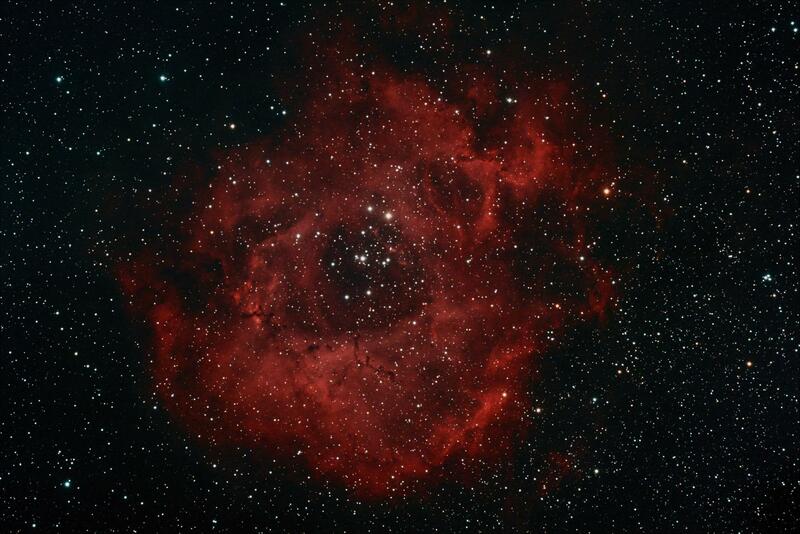 Description: The Rosette Nebula is a large H II region located in Monoceros. Camera: Canon EOS 350Da, CLS, ISO800,5x10min, internal darks, 10 bias, no flats. Guiding: Lodestar with 135mm Lens and 2,5x Barlow, PHD-Guiding. 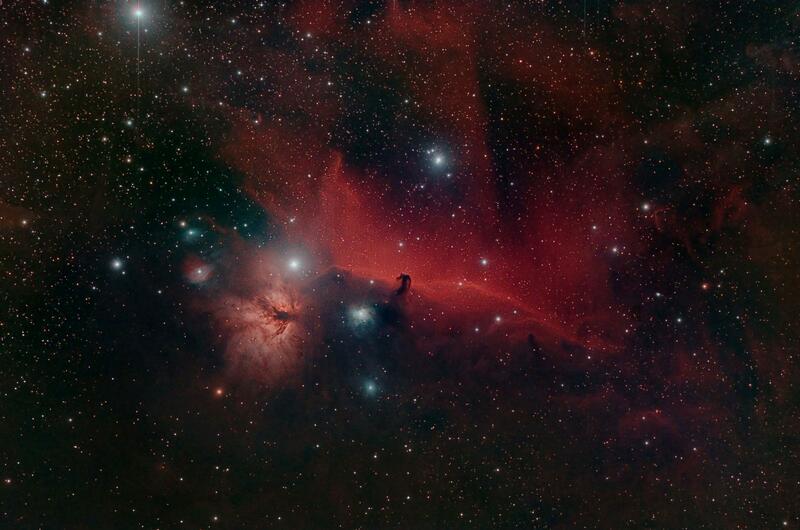 Description: The nebula contains several active star-forming gas and dust regions. Camera: Canon EOS 350Da, CLS, ISO800, 10x10min, darks, 10 bias, 10 flats. 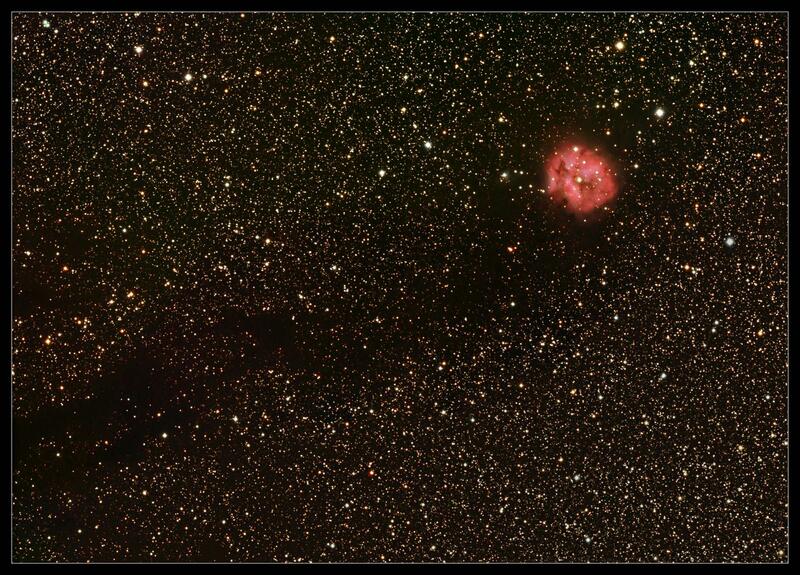 Guiding: Lodestar with 135mm Lens and 2,5x Barlow und PHD-Guiding. Camera: Canon EOS 350Da, CLS, ISO800. Processing: DSLR-Focus, APT-Tools, Fitswork, Photoplus. 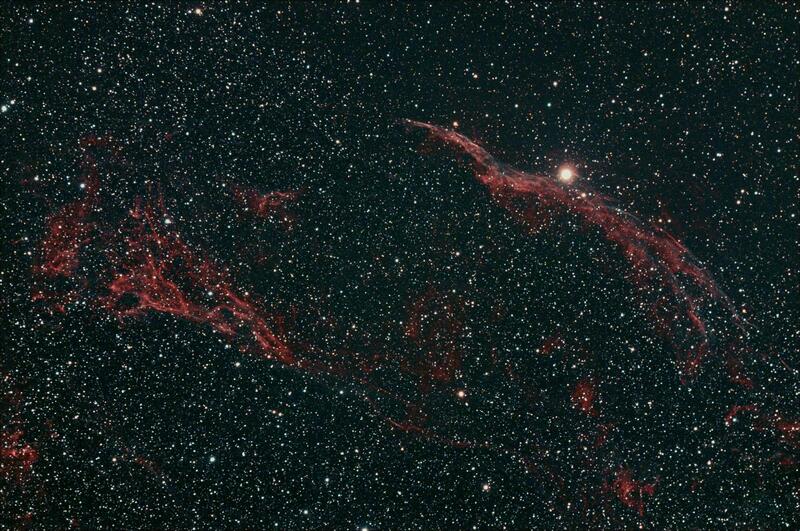 Description:The Veil Nebula is a cloud of heated and ionized gas and dust in the constellation Cygnus. Camera: Canon EOS 350Da,CLS, ISO800, 32x4m, 34 darks, 19 bias, 19 flats. 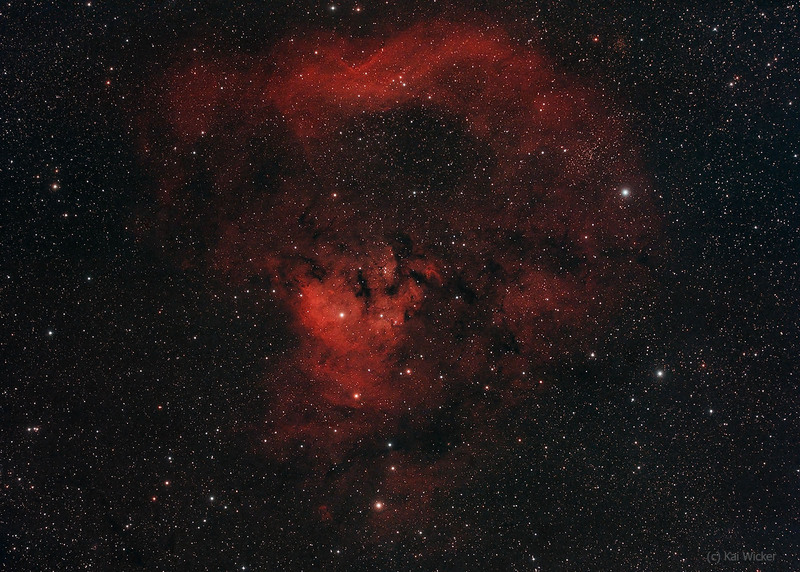 Camera: Canon EOS 350Da,CLS, ISO800,34x4min, 20 darks, 13 bias, 11 flats. 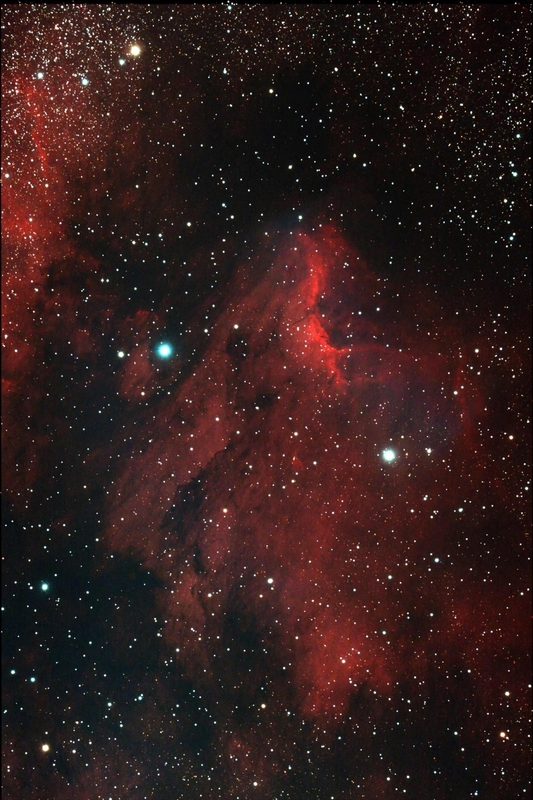 Description: The Pelican Nebula is an HII region associated with the North America Nebula.